Cate Blanchett. Cate Blanchett. Cate Blanchett. She has portrayed Elizabeth I, Katherine Hepburn, Bob Dylan, Galadriel the Elf, and was the object of Judi Dench’s affection. 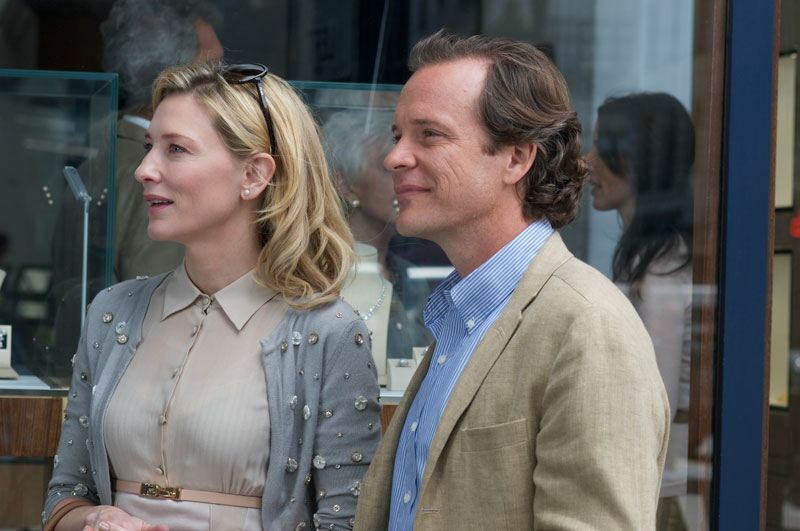 All fantastic performances, yet one of the most riveting portrayals comes in Woody Allen’s latest, Blue Jasmine. Jasmine (Blanchett) is trying to start a new life. She leaves New York and moves to San Francisco to live with her sister, Ginger (Hawkins). They are both adopted and could not be any more different. Ginger believes Jasmine was always the favorite daughter as she was the pretty one. Jasmine’s life has been turned upside down. Her husband Hal (Baldwin) was a wealthy businessman who was caught in embezzlement and fraud. Hal and Jasmine had more money than they knew what to do with, but it was dirty money that was not really theirs in the first place. Jasmine, of course, was oblivious to what was really going on. She was a socialite that had all of the designer clothes, numerous houses, and had all the time in the world for dinner parties, yoga, and pilates classes. It all came crashing down leaving Hal in jail and Jasmine left with “nothing” so she claims. Ginger quickly points out the fact that she still has her collection of Louis Vitton luggage and somehow flew first class to get to San Francisco. Ginger lives a much simpler and cheaper life. She bags groceries for a living and has two sons from her ex-husband Augie (Dice Clay). 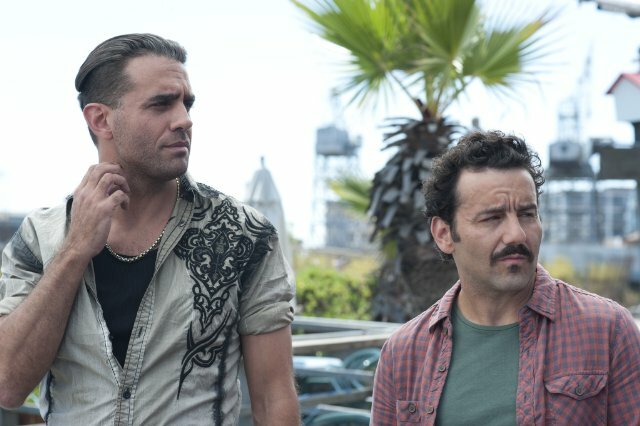 Always one to be dating and flirting, she is now dating a younger brutish guy named Chili (Cannavale). It doesn’t take long for Chili to come to Ginger’s defense and question Jasmine’s motives. She had practically ignored her sister and now that she is broke she swoops in to live with her and ask for her help. Jasmine needs all the help she can get as she has suffered a nervous breakdown and has begun talking to herself due to the fall of her marriage and lifestyle. I would like to think of myself as a pretty big Woody Allen fan. I own a majority of his work and Annie Hallsits at #7 on my Top 10 list. Not many writer/directors, outside of say Tyler Perry, pop out a new film every year. I do admit that he does have his faults and some of his movies are not great. That’s what happens after fifty years in the business. Not all of them can be cinematic masterpieces. When you meet a Woody Allen fan, they will have their favorite decade or set of themes. I am more likely to pop in one of his more physical comedies of the ‘70s any day of the week before the majority of the ones that came in the 2000s era. Some love his more existential films of the ‘80s. Lately when his movies work, they really work like Midnight in Paris. 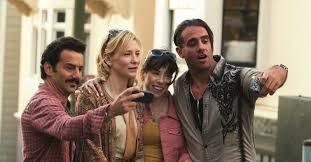 If they flop, they really flop.Blue Jasmine really works on so many levels. Allen’s script is one of the most well-rounded, dimensional, thought-proving pieces he has written in quite some time. There is no denying that there are parallels between this and “A Streetcar Named Desire” and the fall of Bernie Madoff. Many of his films lately have only seen the characters as they are in the short time frame of that story. 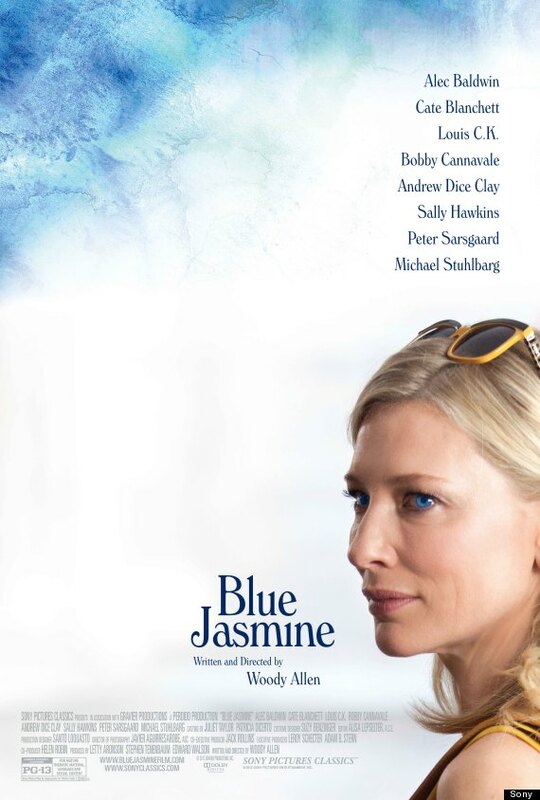 We see the characters of Blue Jasmine throughout an extended period of time as the film shifts between Jasmine’s current life in San Francisco and the extravagant life she led in New York. It reminded me of Annie Hall in its non-linear approach. We get inside the turmoil and frustration that the fall of Hal had on all of our characters, not just Jasmine. How long can you stay happy in a delusional world? What happens when the truth is exposed and it all comes crashing down on you? Allen has created some fantastic characters over the years leading to great material for many of his actors. Dianne Wiest, Michael Caine, Mira Sorvino, Diane Keaton, and Penelope Cruz have all won Oscars playing some of Woody’s characters. 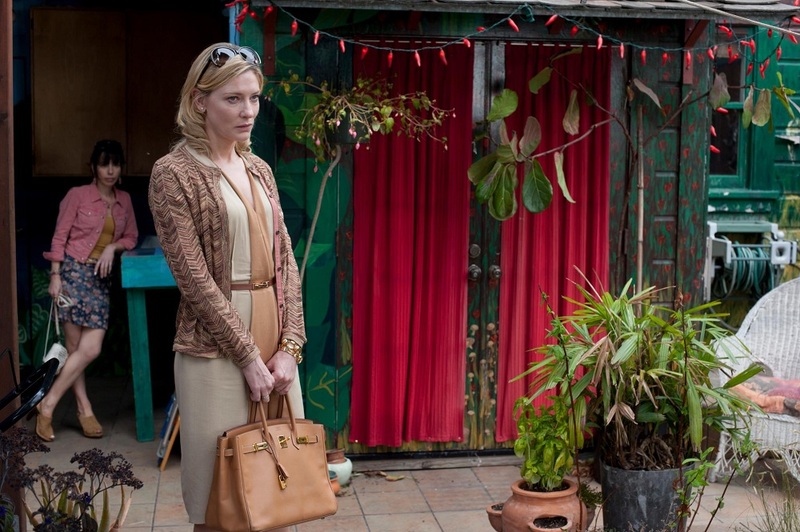 Blue Jasmine is no exception. The whole cast is fantastic. I have heard that his direction is simple with very few takes, but he gets such rich performances out of his actors. Is that the writing, directing, or the actors giving it all their own on their own doing? I guess it is a mix of each. There is not one phoned in performance with each actor giving their A-game. Allen has given each one of them moments to shine. Andrew Dice Clay is known more for his stand-up routine, but I hope he is given more acting opportunities after this. He gives a very real and honest performance that is completely reigned in and far different than you would expect from his comedic persona. 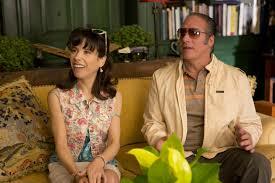 I am slightly embarrassed to say that I have not seen enough of Sally Hawkins’ work before. Cate Blanchett may be getting all of the attention for her performance, but Hawkins is just as heartbreaking, genuine, and flawed. Can we start mentioning how great Hawkins is at the same time we talk about how great Blanchett is? I would be highly surprised if Blanchett is not nominated for an Oscar for her work here. I’ve been throwing around the “O” word quite a bit lately in my reviews. I guess we are getting into that season. Every moment Blanchett is on screen, she is captivating. I could not stop watching every little move or vocal choice she made. I was enamored whenever Jasmine would talk out loud to herself or carry on conversations with full strangers. I have witnessed many people doing this throughout my years of working downtown. She makes so many specific and intricate choices to showcase the wide range of Jasmine between high socialite to post nervous breakdown to her trying to get better and make better choices. The film has another “A Streetcar Named Desire” connection as Blanchett has played Blanche DuBois on stage. You know how they always show a scene from a movie when they announce each nominee? There are plenty of scenes to choose from as the “Oscar telecast” scene to show off her brilliant performance. There are plenty of people who have written off Woody Allen saying he is past his prime or they cannot put aside his personal life. I think the naysayers would be surprised and pleased with his latest. It is one of his strongest films in quite some time. It is not a straight up comedy with the typically Woody Allen neurotic banter, but the film is still funny at times at how shockingly delusional these characters can be. The humor is mixed in to off-set the sadness and uncomfortable moments that come with Jasmine’s pain.Blue Jasmine has the depth that many Allen films of late have been missing.